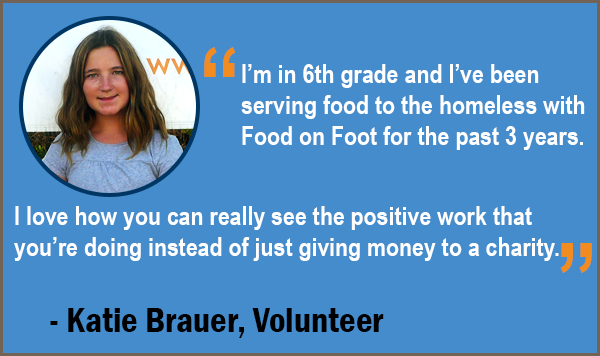 Food on Foot - You Inspire Kids to Give Back! We have a great, fun family activity where instilling positive values in your child is an additional bonus! Food on Foot’s Sunday Serving provides a safe and loving environment for children, ages 6 and up, to volunteer with their family and help distribute food and clothing to the homeless. Sign you and your child up to volunteer here. Do you have a son, daughter, niece or nephew? Please bring them to a Sunday Serving! Your children look up to you! When you volunteer together as a family, you inspire children to become kind, giving, and selfless adults. If you have a child in your family, please invite them to volunteer with you during a Sunday Serving. 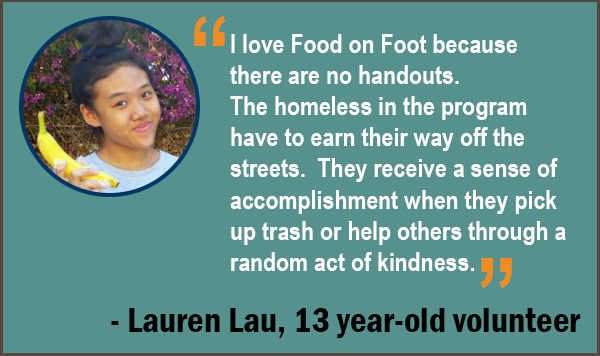 Together, you can make a positive impact in your child’s life as you feed the homeless!